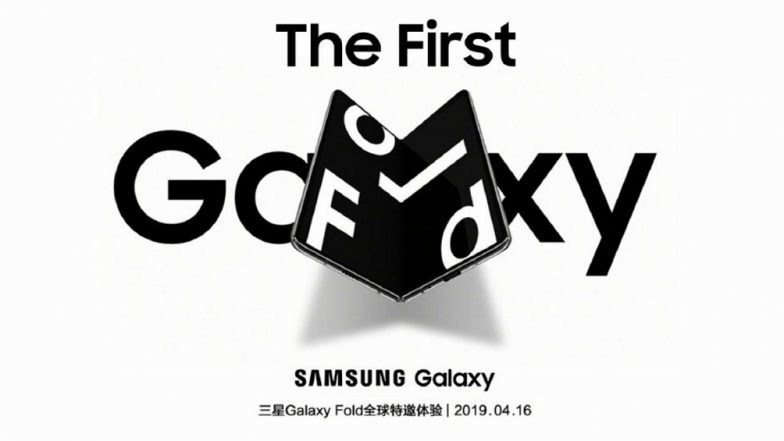 Samsung, the Electronic major will be initiating the pre-orders for its first foldable smartphone, Galaxy Fold by next week in the US market. We already know that the phone maker will be introducing this device in several other markets including India. It is now learnt that Samsung is all set to launch the Galaxy Fold smartphone in China on April 16, 2019 which has been confirmed by the manufacturer. On the other hand, we won't be seeing Galaxy S10 5G version in the country any time soon. Samsung's New Galaxy A80 Phone Features New Infinity Full-Screen Display & 48MP Rotating Camera. Samsung's foldable device will be pitted against Huawei Mate X, which was unveiled in the market earlier this year. The Samsung Galaxy Fold sports in-folding design whereas Huawei's first foldable phone gets out-folding design. We also know that both the devices will be made available in 5G avatars, however, Samsung Galaxy Fold could be seen in 4G LTE version as of now. As far as the pricing go, the Galaxy Fold smartphone will cost around USD 1980 which is approximately Rs 1.37 lakh. Moreover, there are no details available as of now regarding the China pricing. On the specifications front, the foldable phone gets a 7.3-inch Infinity Flex display with in-folding design sporting an aspect ratio of 4.2:3. Moreover, the secondary display of the phone measures 4.6-inch with 21:9 of aspect ratio. Powering the device is Qualcomm's newest 7nm chipset - Snapdragon 855 that will be mated to 12GB RAM and 512GB of internal storage. For photography, there are bunch of camera sensors which are positioned all over the device. The phone packs a triple camera module at the rear that comprises of 12MP primary lens, 16MP ultra-wide sensor and 12MP telephoto sensor. At the front, there is a single 10MP snapper with f/2.2 aperture which is positioned on top of the 4.6-inch display. The notch of the Galaxy Fold also features dual camera sensors that comprises of 10MP primary shooter and an 8MP depth sensing camera. Running Android 9 Pie based on Samsung's One UI out-of-the-box, the phone is backed by 4380 mAh battery. The foldable phone from Samsung is offered in 4 attractive colours - Space Silver, Cosmos Black, Martian Green, and Astro Blue. DJ Koh, President and CEO & Head of IT and Mobile Communications Division at Samsung Electronics confirmed at the launch event of Galaxy S10 that the Galaxy Fold smartphone will be launched in India. However, there is no official launch date announced yet. We can expect Galaxy Fold India launch to happen soon in the near future.